This is a story about cut glass, old and new, a story about trust and betrayal, about courage and cowardice. If the tests and suspicions of a number of collectors are correct, over the last few years as many as a thousand pieces of recently cut glass with a market value as high as $5 million have been represented and sold as genuine antique American brilliant cut glass. In the early 1880s, a few American glass companies, such as T.G. Hawkes and C. Dorflinger & Sons, began to develop a new style of cut lead glass, one that diverged from its Anglo-Irish antecedents toward deeper, allover cutting with more elaborate designs. This often intricately cut style, termed “rich cut” by American manufacturers (now called brilliant cut), flourished for the next 30 years until the First World War, when rationing, and rapidly rising labor costs crippled the industry and began the demise of cut glass production in America. Cut glass was always labor intensive, used high quality lead glass blanks, and was consequently expensive. In spite of its high price, it became very popular and ultimately was produced by more than 350 companies in at least 2000 recognized patterns. Largely ignored by major museums until recently, brilliant cut glass has always had a small but devoted group of collectors. In 1978, such a group organized the American Cut Glass Association, which had grown to 1400 members by 1989, with well-organized annual conventions that regularly draw 400 members. These conventions feature speakers, workshops, and a spectacular dealers show that consistently exhibits the largest amount of fine American cut glass for sale in one location. At the 1983 American Cut Glass Association’s convention in Cherry Hill, New Jersey, Leonard Pearson, an attorney and dealer in Miami who specializes in colored cut glass, told the audience of collectors that, in his opinion, a great deal of the colored, cut to colorless glass that he had seen recently was fake, probably being currently produced in Europe. Needless to say, his remarks were very controversial and caused considerable dismay among collectors. Although many had noticed the sudden and substantial increase in the number of colored pieces for sale, particularly in very rare patterns such as Grecian, Wedding Ring, Aztec, Queens, and others, and even though experienced collectors and long-time dealers had rarely seen such pieces before, the reaction to Pearson’s charges was generally one of hostility and disbelief. Some even accused Pearson of professional jealousy. An editorial in the Hobstar (the ACGA’s monthly publication) signed by ACGA President Carol Parks immediately following the convention indirectly criticized Pearson, claiming that “rumors, gossip, and innuendos persist through viciousness and not in fact.” Parks did, however, appoint her husband, Jim Parks, a successful oil man from Oklahoma City who had assembled an enormous collection over the years that knowledgeable collectors call one of the best in the country, to head an authenticity committee. For a time collectors seemed to become noticeably more cautious about purchasing colored glass, prices softened, and less of it was seen at shows. Pearson, however, had also said that whoever had the skills and the blanks to produce fakes in colored glass could certainly do so in colorless glass as well. Unfortunately, he was all too prophetic. Several years passed, and some collectors and dealers began commenting once again on the number of pieces in rare patterns that were for sale, this time in colorless glass. At the ACGA’s 1987 convention in Washington, D.C., the quantity of truly rare patterns was staggering. 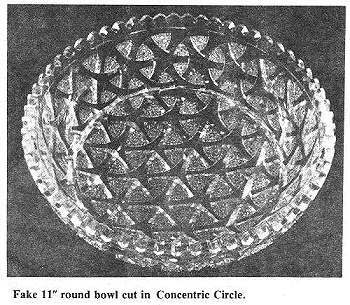 Several dealers displayed not only 14″ and 15″ round trays, but matching sets of 7″ plates and bowls in patterns such as Concentric Circle, Panel, and Trellis. Other shapes, such as decanters, carafes, jars, and vases, were also seen in equally rare patterns. When the few dealers selling these truly fabulous pieces were questioned about their sources, the explanation seemed similar but logical: the pieces were from old collections and were being sold now because the owners needed the money or were no longer interested in collecting. Still, the quantities of rare glass were unprecedented and the questions arose again. The talk was that many of these rare pieces were not old. Harry Kraut, a long established New York dealer in rare cut glass, said, “I just don’t understand how a few dealers can suddenly turn up all these museum pieces.” But Kraut and others who had suspicions were unwilling to say that they thought the pieces were fakes. Prior to the 1987 convention, nearly all collectors thought themselves immune from fakes, which have always plagued other types of American glass. No one seemed to have the skills today to cut glass in these extremely intricate brilliant patterns. Even if some European-trained cutters might be capable, it didn’t seem economically feasible to spend a week or so cutting and polishing a piece and still make a profit, even if it could sell for $5000 to $10,000, as many of the rarities in cut glass do. This assurance was shattered when Herman Defregger, a cutter working for Pepi Hermann’s crystal shop in Gilford, New Hampshire, made a presentation at the Washington convention showing several bowls that he had cut in very elaborate designs using distinctly American motifs. Collectors were stunned to hear that each of these bowls only took a few hours to produce using diamond wheels for cutting, instead of the stone and iron wheels used during the brilliant period. Hermann regularly produces a number of stock items, such as 12″ trays in intricate, traditional designs (but not copies of old patterns) that list for $788 each in his catalogue. This writer showed Defregger a rose bowl in Grecian, red cut to clear, that was earmarked for the auction, and asked if he could duplicate it. He said, “Easily. The blanks are available in Germany, and the cutting would only take half a day.” This rose bowl, if old, would easily sell for $5000. Clearly, there could be immense profits made by selling newly cut glass as old. Miami Beach, O’Hare (Chicago), Houston and Pasadena. Nearly every serious collector had purchased glass during the past ten years from Wiener, some assembled entire collections from him. Hall, while doing antiques shows, buying glass, and viewing collections in many states, discovered that patterns he had thought were quite rare were in fact in many collections, often in very unusual sizes and shapes. Patterns such as Aztec, Byzantine, Rex, Alhambra, Concentric Circle, Grecian, Columbia, and others seemed to be much more common than anyone had realized. Hall confided his suspicions to his close friend, Max Redden, also from Kansas, a very well-known and highly knowledgeable collector. Redden had been developing his own ideas about the large number of rare pieces he had seen at shows and in collections and together they decided there were just too many unanswered questions. Both of them came to the conclusion that much of this glass was newly cut because of various characteristics that did not match known old pieces. In late October 1986, Hall confronted Herb Wiener, who denied that any of the glass he sold was new or fake. Wiener did agree, however, to refund Hall’s money in exchange for pieces Hall felt were questionable. In November 1986, Wiener signed a promissory note in favor of Hall for $91,550, payable at $5000 per month. Wiener paid Hall a total of $70, 379.50 and then for reasons still unclear, refused to make further payments. The majority of the glass Hall contended was new consisted of ten 15″ round trays, all in rare patterns, with ten sets (six pieces per set) of matching 7″ plates. 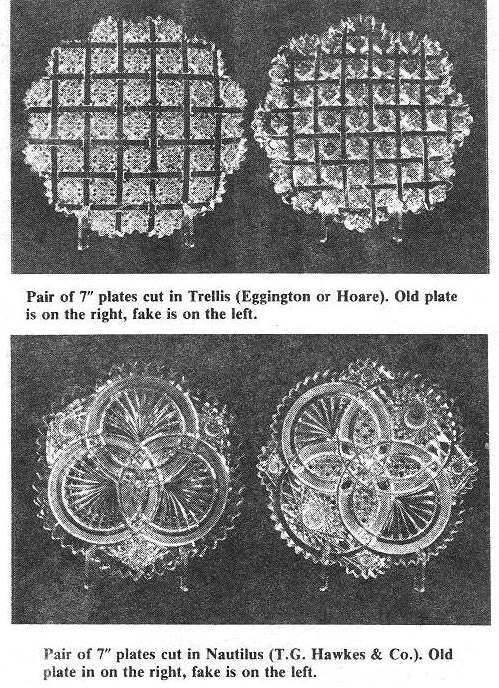 The trays alone had sold for $6500 to $21,000 each, and the 7″ plates averaged $1500 each. Hall did not dispute a substantial quantity of other glass he had purchased from Wiener, because it appeared to be genuine. 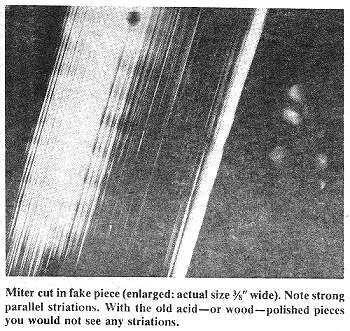 During late 1987 and early 1988, Hall, Redden, and others developed a series of tests or observed characteristics that they felt could determine whether cut glass was old or new. 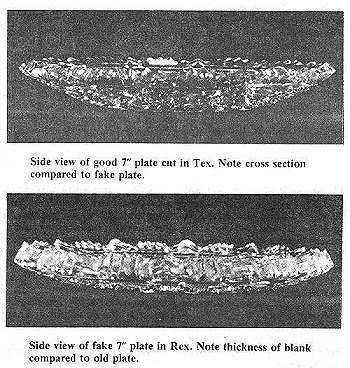 First, the blanks used for certain pieces, such as 7″ plates (a form very much desired by collectors), were distinctly thicker and had different cross sections than known originals. Second, when signed, the acid-etched signatures on suspect pieces were smudged rather than clear and distinct. The signatures on originals are almost always sharp, even if faint. Third, most but not all of the questionable pieces had faint parallel striations in the major miters, which was later shown to have come from the use of diamond wheels to cut the glass. Documented old pieces never exhibited these marks except where recent repairs had been made with a diamond wheel. Fourth, all of the suspect pieces were in mint condition without any damage or wear marks on the bottoms. This was highly unlikely if the glass was really 80 or 90 years old. By contrast, virtually all of the documented old cut glass showed at least some wear on the base and sometimes minor damage to other surfaces. Signs of wear are a well-known standard in judging glass of any period. Either the absence of wear or the presence of faked (ground) wear is usually a tip-off. The absence of wear marks had been a major clue that helped Dwight Lanmon, director of the Corning Museum, uncover a series of fakes in blown three-mold glass (see Journal of Glass Studies Vol. XV (1973) 143-173). Finally, and probably most important, they discovered that nearly all genuine American brilliant period cut glass will fluoresce a pale lime yellow under long wave ultraviolet light (blacklight), while the newly-cut glass fluoresced a distinct purple-pink. The pale yellow fluorescence of old glass was remarkably consistent, somewhat surprising considering that at least 20 American companies produced blanks during the 35 years or so that brilliant cut glass was produced. This fluorescence seemed unrelated to the lead content because non-lead 19th-century American pressed glass fluoresces a similar yellow. But they also discovered that intaglio pieces and patterns produced very late in the period (circa 1920), such as Hunt’s Royal, fluoresced the purple-pink associated with new glass. This meant that the blacklight test was not diagnostic for late glass, but was consistent with the theory that glass composition had changed. It is now believed that the difference in fluorescence between old and new glass is due to the deliberate presence of small amounts of manganese oxides used in the old formulas to decolorize glass. After the brilliant period, glass chemistry advanced, and manufacturers no longer needed these compounds. Dr. Robert Brill, museum scientist at the Corning Glass Museum, explained why the new glass had to be cleaned much more often than old glass. Lead glass made in Europe today has a higher sodium content than old American lead glass, which attracts moisture to the cut surfaces. This moisture tends to dissolve surface dust and create a scum. Further supporting the validity of these tests was that the questionable glass always failed more than one test. For example, an 8″ bowl in the Aztec pattern had a smudged Libbey signature, diamond wheel marks, and purple-pink fluorescence. A 7″ plate in Rex was cut on a very thick blank with an indistinct Tuthill signature and had a purple-pink fluorescence. Both pieces were in mint condition without any sign of wear on the bottoms. Hall and Redden looked at literally hundreds of pieces of glass in many collections and several well-known museums to confirm that these tests could indeed distinguish old from new glass. With the assistance of Kenneth Wilson, former curator at the Corning Museum of Glass and a recognized authority on American glass, they blacklighted ten pieces of Libbey glass of absolutely known date and provenance at the Toledo Museum, including the great punch bowl made in 1904 and exhibited at the St. Louis World’s Fair. Most of these pieces had come directly from the Libbey Glass Company. This examination confirmed that all fluoresced as expected: lime yellow with none of the purple-pink characteristic of the new glass. In addition, Hall had hired a number of other consultants, including several glass chemists, to further confirm the validity of these and other tests. Pepi Hermann, the highly-experienced European-trained cutter who produces high-quality contemporary cut glass in his New Hampshire shop, was one of Hall’s consultants. Hermann is convinced that the blanks for the new glass came from Europe, probably Germany. He used German and Austrian blanks, which, when blacklighted, fluoresced purple-pink, similar to the suspected pieces. 1. The lead content of the suspected reproductions was quite uniform, 24-25% by weight. The lead content of the old pieces was more variable but always considerably higher, 34-36% by weight. 2. The sodium content of the suspect glass was at least ten times higher, 2-3%, than in the old pieces, which were 0.1-0.25% by weight. This difference would account for the surface film so often seen on suspect pieces. 3. The manganese content of the suspect pieces was in trace amounts, less than 0.01%, but the old pieces had 0.02-0.10% by weight. This means that the old blanks had between two and ten times as much manganese, which would account for the difference in fluorescence. 4. In general, the composition of the suspected reproduction pieces was extremely uniform, indicating a single source for the blanks. This uniformity contradicts the claim that these pieces were from different companies. The old pieces showed much more variation, which would be expected from different companies. Hall and Redden continued to look at collections around the country and continued to discover large quantities of glass that they felt was suspect. Hall said he saw at least eight collections with $50,000 worth of bad glass in each. Not all the collectors agreed, however. At least one owner is convinced his glass is genuine and does not believe in blacklight testing. Even collectors with much more modest collections began to find “bad” pieces. This writer had two, a large rose bowl in Chrysanthemum, purchased for $1400 in 1986 from Ray and Grace LeFevre, and an ice bucket in Aztec, purchased for $3500 in 1988 from Billy Rau. Both items were returned to the dealers and money refunded. Many months later neither dealer would comment as to whether those pieces were later resold to collectors. This writer spoke with a number of collectors who claim to have purchased bad glass. Paul Cheyney, a long-time collector from Iowa with a 1300-piece collection of many rarities, claims to have purchased $79,000 of bad glass over the past six years. These include a set of seven 6″ square plates in Byzantine, a 14″ round tray in Arabian, a 15″ round tray in Waldorf, a 12″ round tray with six matching 7″ plates in Aztec, and an enormous jar in Aberdeen. Art Clardy, another Louisiana collector, claims to have $85,000 in fakes, primarily 14″ and 15″ trays in rare patterns, such as Kensington and Trellis. Four other collectors interviewed at the New Orleans convention each claim to have $10,000 to $30,000 in bad glass. Three of them, including Clardy, have tried repeatedly to contact the dealer involved but have never received replies. All these collections were reviewed by Redden, who is convinced the suspect pieces are fakes. Jim Parks, the authenticity chairman, convened his committee at the 1988 Toledo, Ohio, convention for the first time since he was appointed in 1983. Max Redden, a member of this committee and clearly the driving force to uncover the dimensions of the problem, first proposed that the dealers’ show be vetted and dealers be forced to remove any glass that the committee felt was fake or questionable. Initially, Parks was opposed to this, fearing that the Association could be sued, but finally agreed. The dealers’ show was vetted using blacklights, and approximately 70 pieces of allegedly bad glass were discovered, most in the booths of three dealers. One dealer claimed that all of his glass had come from old collections, except for a group of thirteen 7″ plates purchased immediately prior to the convention. These plates, all in the rarest patterns, such as Nautilus, Rex, Byzantine, and Alhambra, were priced at $1500 to $2500 each. Neither ACGA President Bill Watterson or Jim Parks would initially disclose even the number of pieces removed from the dealers’ show much less the dealers’ names. At the convention both attempted to minimize the impact by claiming that it was “only a tiny percentage of the glass in the show.” This was true on the face of it, but it ignored the fact that nearly all of the pieces removed were rare and expensive and constituted a significant percentage of the glass priced above $1000 that was displayed for sale. Membership pressure forced a special session on authenticity, in which Redden described the tests and the tremendous amount of fake glass he had seen during the past year in various collections. By the end of the convention many collectors in attendance began to realize that most cut glass in a rare pattern purchased within the last seven or eight years without an ironclad provenance should be considered suspect until tested. An equally large number of collectors and dealers still did not think these tests could determine whether the glass was new or old and felt this was just a tempest in a teapot. Some of those unconvinced by these tests have attempted to explain the results by noting that a few American companies were known to have occasionally used European blanks. This still would not explain the consistent difference in fluorescence between documented old glass and the suspect pieces, to say nothing of the invariable association of diamond wheel marks and smudged signatures on pieces that fluoresce purple-pink. 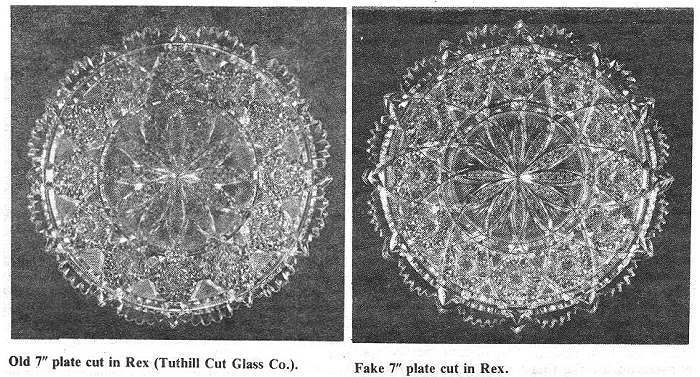 Others claimed that diamond wheels were used by a few companies during the brilliant period, but Estelle Sinclaire, co-author of The Complete Cut & Engraved Glass of Corning, said she has never found any reference to the existence or use of diamond wheels in cutting glass prior to 1940. John Jepson, retired president of the Norton Company, which had a virtual monopoly on abrasive wheels in this country prior to World War II, said he remembered diamond wheels first being used in industry during or slightly after World War II. Pepi Herrmann said he first saw diamond wheels being used to cut glass during the 1950s, when he was an apprentice in Austria. He said that diamond engraving wheels may have been used earlier, but these are quite different from cutting wheels. During the remainder of 1988 and early 1989, Hall, his consultants, and attorneys continued to gather evidence for the lawsuit. Wiener was forced to produce financial information and purchase records. But the court placed these disclosures under a protective order, which prevented Hall and his attorneys from disclosing any information to others. In response to questions from this writer about sources of some of his “landmark” pieces, Wiener said that he really didn’t keep records of the individual pieces and had to rely on his memory. Certainly one of the most important keys to defending the authenticity of this glass is the ability to document previous ownership. Without any sort of provenance, serious questions will remain about rare pieces, especially those that “fail” the tests. By now the appropriate response for the ACGA was to have published an article in the Hobstar, alerting members to the apparently widespread problem of fakes and describing the tests in detail. But Bill Watterson and Jim Parks still refused because they feared the possibility of being sued, both personally and for the Association. The Association’s counsel, Gray Sexton of Baton Rouge, had told them repeatedly that they had nothing to fear as long as they only expressed opinions and didn’t name names. Sexton, who by this time was also helping represent Hall in his lawsuit, was told by Watterson that Sexton should resign because of a “conflict of interest.” When news of this leaked out, few felt that Sexton had a real conflict of interest; in fact some argued that Sexton would be invaluable to the Association because of his knowledge of the case. Sexton, however, resigned as the ACGA’s counsel in early 1989. In July 1988, the ACGA’s board of directors voted to spend $5000 for research on the problem of fake glass, but one year later no action had been taken and none of the money spent. So the ACGA, at the national level, remained silent. As the months passed local chapters took the initiative and began doing programs describing the fakes and testing methods. This approach proved effective and alerted even more members to bad glass in their own collections. But those collectors who did not belong to chapters, either because of geography or disinterest, remained largely ignorant of the problem. 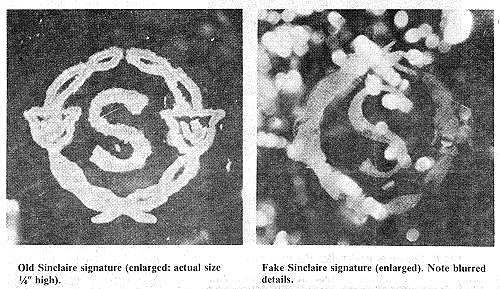 In a May 1989 interview, Parks said he had long suspected that a great number of these rare pieces were fake, but could not prove it. In April 1989, just as Wiener was about to be deposed, he and Hall resolved their lawsuit under a confidential settlement, with both parties prohibited from disclosing the specific terms. In addition Hall’s research and pretrial information were to be kept confidential. Wiener, in a May 1989 interview with this writer, denied that any of the glass was new and said that it had all come from a number of large old collections. When asked why so many of these rarities had emerged, he replied that rapidly rising prices for rare glass were drawing good pieces into the market. He also said “these tests prove nothing,” and criticized them for their lack of scientific precision. He did allow that there might be a few pieces of “bad” glass in circulation, but certainly not the amount claimed by Hall and Redden. At the ACGA’s 1989 convention in mid-July in New Orleans, the dealers’ show was vetted. This time only two new pieces were discovered, proof that the testing was having its intended effect. Redden presented an hour-long slide lecture illustrating the differences between the new and old glass, which was very well received. Few collectors left unconvinced that this glass is newly cut. In addition, Redden constructed an ingenious light box that allowed people to clearly see the difference in fluorescence between the new and old glass placed side by side. In November 1989, Jim Parks resigned as chairman of the authenticity committee and was replaced by Max Redden. In the January 1990 issue of Hobstar, Redden published an article describing the characteristics of the suspected newly cut glass, estimating that $3 to $5 million worth of bad glass had been sold over the last eight to ten years. Redden’s article was the first official warning by the ACGA to its members. The article listed the following 36 patterns that he determined had been reproduced, all immediately recognized by cut glass collectors as rare: Aberdeen, Alhambra, Arabesque, Arabian, Assyrian, Aztec, Byzantine, Calve (triple miter), Chrysanthemum, Cluster, Columbia, Comet, Concentric Circle, Coronation, Croesus, Delphos, Drape, DuBarry, Genoa, Grand Prize, Grecian, Imperial, Isabella, Kensington, Marcella, Nautilus, Panel, Queens, Rex, Shell, Theodora, Trellis (Lattice & Rosette), Waldorf (Quatrefoil & Rosette), Wedding Ring and Wheat. Assuming that this questionable glass is new, still unknown is who actually cut and signed the blanks. Most believe it was done in the traditional fashion with skilled cutters holding the glass, while a few feel that computer-guided cutting equipment was involved. But since it was demonstrated at the 1987 ACGA convention that at least one cutter in America could produce glass of this quality, it is safe to assume that at least a few other cutters have the same skills. There may be even a new generation of fakes as forgers improve their already formidable techniques in reaction to collectors’ increased ability to detect problems. Given their obvious skills and sophistication, they may either try to produce new blanks that fluoresce correctly or buy out uncut blanks that are still occasionally seen for sale. If they are successful, the blacklight test alone will not identify what could be a second generation of newly cut glass. Furthermore, this writer has recently seen at least two examples of obviously newly cut glass that appeared to have been wood polished, which would remove any diamond wheel marks. Even more disturbing, however, are some recently offered pieces in very rare patterns that are unsigned (many companies did not acid stamp their glass), absolutely pristine with no wear marks or even minor flakes, which fluoresced correctly. Several of these pieces seemed suspiciously shaped or abnormally thick, and in this writer’s opinion, are fakes. Consequently, it cannot be emphasized enough that collectors much continue to be skeptical of any rare, unsigned pieces without documented provenance. Further, no single test should be relied upon to determine authenticity. Will there be further court action? Probably not in civil court. The cost of another lawsuit might prove prohibitive. Hall estimated that he had spent $70,000 in research, travel, and attorneys’ fees and would have spent another $80,000 to complete the trial. Collectors who might have planned to use Hall’s research in another trial have been blocked by the settlement terms, which declared the information confidential. The criminal court is a possibility, however. In the late fall of 1989, the FBI began an investigation after receiving a complaint from one of the collectors who felt he had been badly burned. By January 1990, FBI field agents had interviewed a number of collectors (including this writer) and several dealers, but would not comment on their findings. Dealers admit that Hall’s lawsuit and fears of fake glass have shaken the confidence of many of their customers and have had a substantial impact on their sales and prices for rare pieces unless they have been absolutely authenticated. Refunds were understandably a sensitive issue with most of the dealers, and some refused to discuss the issue. Elias Bustamante, a dealer and show promoter from Atwater, California, and Bob Hall said they had each refunded in excess of $50,000 and would continue to offer refunds to customers dissatisfied for any reason. Collectors, whether of glass, furniture, or paintings, must realize that a healthy dose of skepticism in regard to sellers’ claims can help prevent much grief. Clearly, the two real heroes here were Bob Hall and Max Redden. These men spent tens of thousands of dollars (particularly Hall) and hundreds of hours to pursue this cause with little support and, in some cases, active opposition. Their courage, conviction, perseverance, and sense of moral outrage publicized this problem, which might not have ever come to light without their efforts. All collectors, museums, and honest dealers, now and in the future, owe them a tremendous debt.